The Cundill History Prize names not only a shortlist–on which we reported earlier–but also what might be called an “even shorter list” of three finalists. Those titles were named just at the end of last month, and we have them for you now. The winner of the prize is to be announced a week from today, on November 15, as part of a series of activities at McGill University including the annual Cundill History Prize Lecture, which will be delivered by the British historian Daniel Beer–last year’s winner for The House of the Dead: Siberian Exile Under the Tsars from Penguin Random House. In June, as we reported, the program named its five-person jury for the 2018 award. The jury comprises Mark Gilbert, chair; Carol Berkin; Caroline Elkins; Peter Frankopan; and Jeffrey Simpson. In commentary about its finalist selections, the jurors’ notes include one observation from Gilbert, who writes from Bologna, “Having invested thousands of hours into the research of their books, these outstanding historians have managed to turn their material into works of history that are also irresistible reads. At Oxford, Frankopan is quoted, saying, “When you are writing history, you need a sprinkling of fairy dust, something that allows your prose to spring from the page, and to bring the reader with you. Our finalists are a masterclass in how this is done. Publishing Perspectives readers will have noticed that two of these finalists are contextualized biographies of authors–Wilder and Conrad. In some pertinent, quick notes about the final trio of titles, we’d point out to you that Fraser’s Prairie Fires is a 2018 Pulitzer winner in biography and is reportedly the first comprehensive historical account of the life of Laura Ingalls Wilder, author of the Little House on the Prairie books. In commenting on the selection, Elkins is quoted, saying, “Caroline Fraser blends a fascinating social history of the US with histories of the environment and the family. She has gathered a vast amount of material, with a forensic eye for detail, and she has pulled it all together brilliantly. 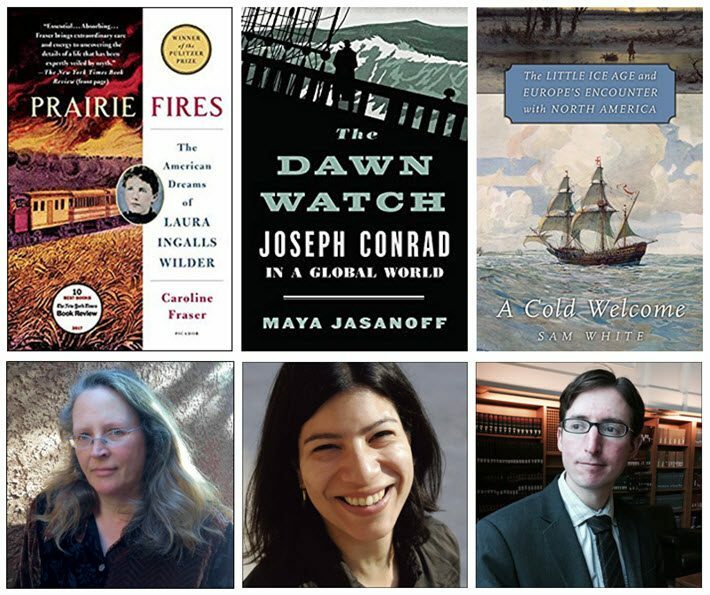 Jasanoff, author of The Dawn Watch, is a Harvard professor in history and her book on Joseph Conrad “presents the Polish-British writer as someone who embodied the issues of his turbulent time: migration, terrorism, the tensions between global capitalism and nationalism, the promise and peril of a communications revolution,” in the words of the program’s organizers. Simpson, speaking for the jury on Jasanoff’s book, says, “Maya Jasanoff shows Joseph Conrad as a guide through issues bigger than him. And, in so many ways, these are the same issues we are grappling with, in different ways, today. And Berkin addresses the choice of A Cold Welcome for the jury, saying that Ohio State University associate professor Sam White has created a timely reminder of “the risks of a changing and unfamiliar climate,” based in what’s called the Little Ice Age and its threats to Europe. “Sam White has written a well-judged, nuanced, and deeply humanistic book,” Berkinj is quoted saying. “As a scholar in his field, I am happy to say that, having read this work, I will have to revise every lecture I have ever given. The winner of the Cundill will be awarded US75,000—said by organizers to be the richest purse for nonfiction in English. Each of two runners-up will receive US$10,000.